Alright, we are back with a post-Mother’s Day Puddles of Myself update. I hope you were all kind to your mothers. I had a great Mother’s Day with my family out at some of the vineyards on eastern Long Island. We tasted a bunch of wines, bought a bunch of wines, my dad purchased some spicy mustard and we ate delicious steaks at this random small place on the side of the road. Besides from that, I spent the weekend sitting by the Long Island Sound in the sun, drinking beer and watching dogs run around on some hills. In addition to playing rounds of the classic beer drinking game caps, which I think I will need to do a detailed column about – seeing as the game sort of formed me in many ways as the semi-man that I am today. The main occurrence from the weekend was the recording of the Puddles of My Podcast Gilmore Girls Podcast, starring Janelle Sing and Erik Lilleby. This podcast was a few weeks in the making, but it was well worth the wait. These two know all about the Gilmore Girls and the characters and story arches that inhabited the show. This is a 70-minute plus podcast that will be going up on the blog tomorrow afternoon. Now, I do not usually show my bias, but this is the best podcast that has been put up here so far. - My sister played this video for me yesterday. I had forgotten about it. Great stuff. - Friday night, the Celtics put on one of the most horrific playoff performances I have ever seen in my life. They just did not show up to play Cleveland and seemed to be relying on Lebron’s elbow being injured rather than jumping out and taking it to Cleveland immediately, especially when they had them on the ropes after Game 2. To be fair, Lebron was shooting lights out all game and the refs were making some bogus calls. 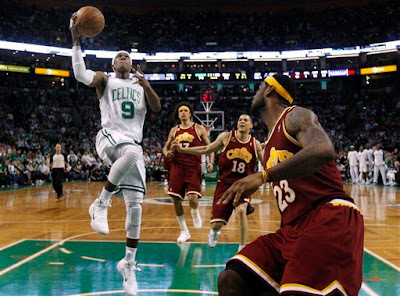 However, it was painfully obvious once more, that Rondo can beat anyone on Cleveland off the dribble, but was very hesitant in doing so on Friday night. - All that being said, on Sunday afternoon the Celtics showed up. Rondo was absolutely in control of the game and put up an insane line of 28 points, 13 assists, and a staggering 18 rebounds. If you watch highlights from the game, Rondo instinctively knew where to be for each rebound – I had never seen something like that before. Also, Rondo completely controlled the game by moving the ball around, dictating the tempo the Celtics and the Cavs would play at and just basically had his hand in everything throughout the course of the entire game. He also was able to beat the Lebron Chasedown Dunk by pulling off a perfect behind the back pass that looked extraordinarily easy. Other players should take note in order to begin to debunk the ridiculous myth that is already starting around Lebron’s Chasedown Block, which many times should be called goal tending except that the referees haven’t seen anything like it before so they are hesitant to make the correct call. - The Celtics/Cavaliers series is tied at two games apiece going back to Cleveland on Tuesday night for Game 5. Basically, the Celtics have to come out pushing the ball against the Cavaliers and try to get them on their heels early. They need to drive at Lebron and make him work on defense. 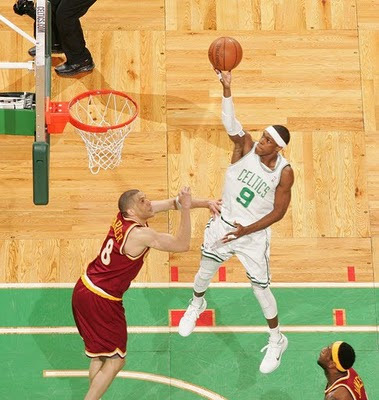 Rondo especially needs to get in the lane. If Lebron is going to guard him as is rumored, that is even better, Rondo can try to get him in foul trouble, wear him down and maybe even make Lebron exert that “injured” elbow even further. Because you know that Cleveland crowd will immediately get quiet as soon as anything goes wrong. I have no sympathy for those fans and their losing ways. They are fair-weather fans who have no concept of the “Get back in this guys” cheer that is so necessary for a successful franchise and playoff run. - I really enjoy the Phoenix Suns and the way they are playing basketball right now. The Suns have a tremendously enjoyable team to watch. They still play an untempo level of basketball that is leftover from the “Seven Seconds or Less Era” from earlier in the last decade. Now, however, they have some more grit and glue players like Jared Dudley and Grant Hill, who, thanks to his years of injuries, still has fresh legs at 37 and has managed to make himself over into a defensive stopper who can also score and stretch the floor when you need him to. He has molded himself into a 1997-1998 Scottie Pippin mold, which in many ways is as hard to mold into as the 1997-1998 Michael Jordan mold that Kobe has basically successfully molded himself into. The Suns/Spurs series was extremely entertaining even though it was a sweep. Each game was must watch basketball, it was played at an extremely high level, and you had two legends from this era and two of the smartest players of this era, Steve Nash and Tim Duncan facing off. I hated both of these guys at one time or another in their careers, but I have reached a level of maturity to now admit how terrific they each are. It was a fantastic series to watch and I am rooting heartily for the Suns to come out of the West. - The Lakers appear to be the Suns’ likely opponent in the Western Conference Finals. The Lakers are basically outclassing the Jazz with Kobe, Gasol and the rest of their supporting cast. On Saturday, we saw the value that Artest adds to the team when he actually scores. The Jazz are working hard to stay in this series, but the Lakers just have too much talent. I think the Jazz might steal the game tonight, but the Lakers should win Game 5 in Los Angeles on either Wednesday or Thursday. Kobe has taken his game up a notch in this series after getting scared by Oklahoma City and looking slightly older. He has really put on the late-era Jordan suit that he has flashed numerous times during the regular season. We’ll see how quick the Lakers close out the series and if they can control the tempo against the Suns in the Western Conference Finals. - In the other non-competitive series, the Magic just look dominant. Granted they are playing a headcase Hawks team that will probably be disbanded after this season, but the ease with which they are taking them apart is remarkable. The Hawks have talent and should have been able to win one or maybe two games to scare the Magic, but this one looks like a sweep that the Magic will complete tonight. If so, the Magic will have about a week of rest to prepare for the Cavaliers or the Celtics who will be playing a six game and most likely a seven game series. It will be interesting to see if their easy route through the playoffs will have a detrimental effect on the Magic as it did to the Cavaliers last year. This team seems focused and they have that dominant inside presence that the Cavaliers lacked, as well as their dangerous wing players – even Vince Carter seems to be trying. This Magic team may be playing better and may in reality be better than the team that went to the Finals the year before. That’s all the NBA chat for now. We have the Gilmore podcast tomorrow afternoon and most likely a music column for Wednesday (thinking Kate Bush write-up) and then a podcast with my friend Jenna Morse and her boyfriend where we will be discussing movies, making movies, a good film, and maybe some sketch comedy favorite moments and do’s and don’ts. So, as always, stay with me here because this blog is going to the top. The top of what, I don’t know, but we’ll get there. Have one on me tonight – hopefully the basketball isn’t too terrible.